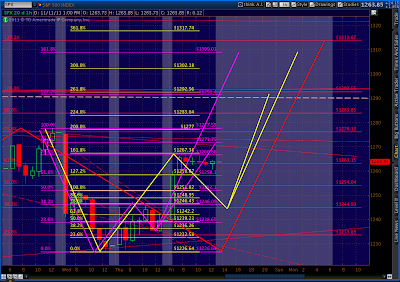 Today’s action fulfilled the small Butterfly pattern’s target, reaching 1266.98 versus our target of 1267.38. 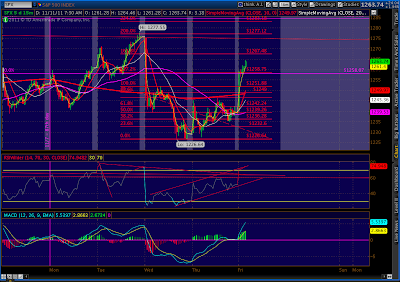 This was also the .786 from the recent 1277 high, so we are probably safe in calling this latest move complete. Still, there is at least a 50/50 shot at a higher high over the next two weeks. It would most likely come around the 1307-1313 level as a result of one of this jumble of harmonics patterns playing out. Note the 87-day cycle lines. These date back to May, when I first noticed a weird regularity to the market’s plunges [see: Sure It Works in Practice]. 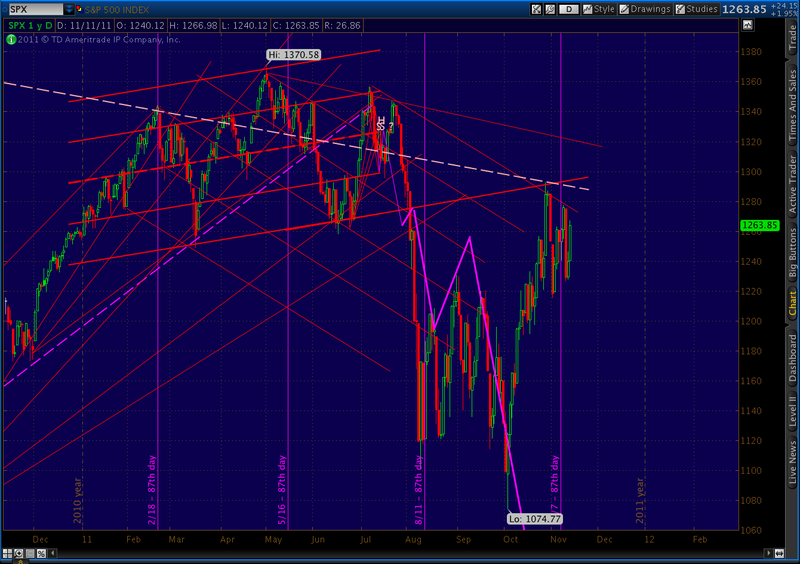 I’ve since refined the cycle, which in 2011 got stretched and compressed just as it did in 2007/8. 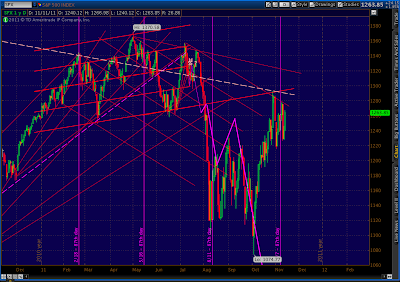 Since one of these original dates just occurred, it’s probably time to revisit the pattern. I’ll try to post more over the weekend. The Butterfly we discussed yesterday has played out perfectly at the 1.272 at 1258…so far. We also discussed it going on to fulfill the 1.618 at 1268 which, after the Michigan sentiment numbers, looks like a distinct possibility. 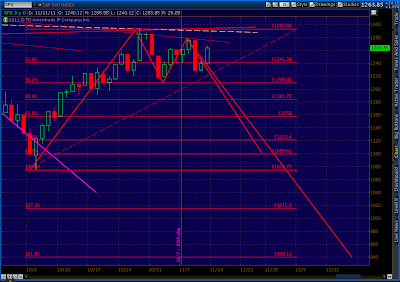 Also, 1271 marks the .886 retrace of the recent drop from 1277.55. It could work as a Bat pattern Point D.
Personally, I’m starting to lighten up on longs and raising cash a bit more than normal (usually, if I have lunch money, I’m under-invested.) 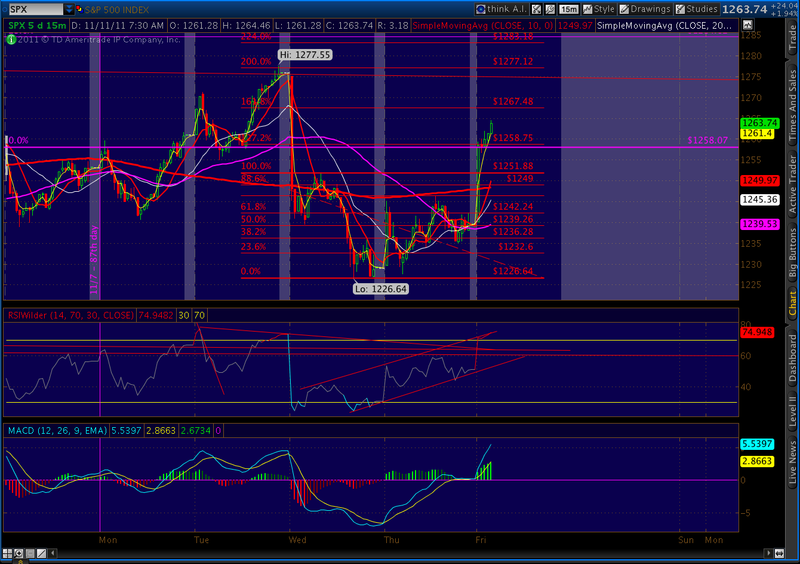 I’ll probably add to existing longer-term shorts around 1268, depending on which way the wind’s blowing. Though I’m convinced the market will be much, much lower in the next 30 days, I’m not yet convinced that we won’t see one last run at 1307-1313 before turning back down. Hence the somewhat straddled position, with longer-term shorts and near-term longs on which I’m lightening up. But, remember, I’m almost always early. 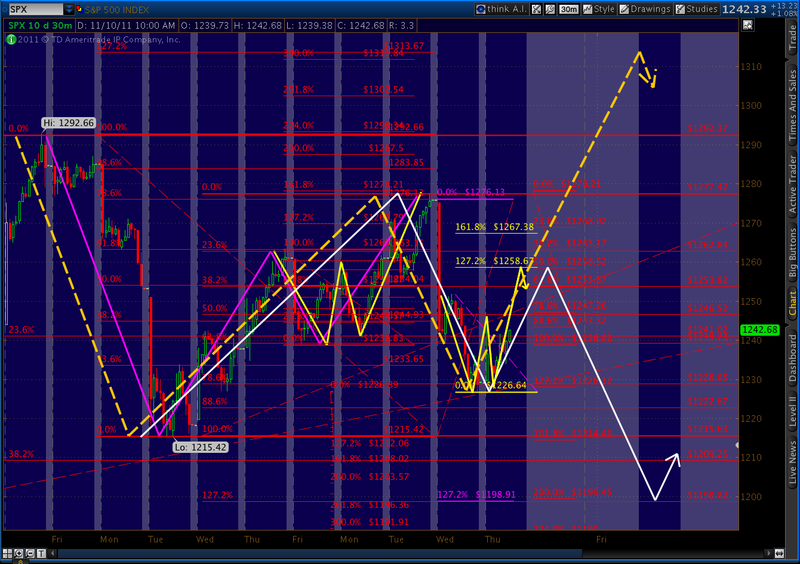 So, this course no doubt will leave some upside profits on the table and get me into shorts at too high a price. I can live with that. And, in this market, I’d much rather be early than late. Everyone has to trade at their own comfort level. Not everyone is going to be comfortable buying puts on a day when SPX is up 26. The larger (dashed, yellow) Butterfly could go on to tag 1313. Or, we could turn down immediately after completing the small Butterfly (solid yellow, on right) at 1268, and head down to 1199-1215 which, readers will recall, is our line in the sand — regardless of whether we head higher in the interim. Well they can't rig it well enough that flipping a coin for long/short, throwing darts at the finance section of the Wall Street Journal, and remaining in the position for a predetermined length of time won't average out to 50% win/loss 🙂 Find another couple percent somewhere and you're golden! One can argue endlessly for and against manipulation of markets/economy/politics/gold etc but in this current environment (internet driven gossip, computer/algorithm driven high speed trading) I would hazard to guess that there are very few if any secrets Wall Street et al doesn't know and enough they do know to maintain absolute supremacy over the average stock market punter. Not to mention the edge of having bought and paid for political connections. The average Joe was strip mined in '08/'09 and now it's the turn of the average Speculator. I wonder how different things might be if it were not so easy for the big players to find all the fish. The internet is undeniably a revolutionary innovation with many good qualities but it is also the biggest and baddest 'fish' finder ever invented. New regular reader here, I like what I see the last few weeks 🙂 funny you mention "Sure it works in practice", was the post I read when I first bookmarked you. I've long skimmed Daneric's posts/board, I like his style but I wouldn't dream of taking his advice until [I]after[/I] a big market plunge / CNBC freakout. Guy makes great bottom calls but he can't call the top of a paper bag. That said I'm net short so I might have to raid the couch cushions to average down if this thing goes on to 1313..
Pebble everything I follow is looking ripe for a move to SPX 1246 at some point next week. 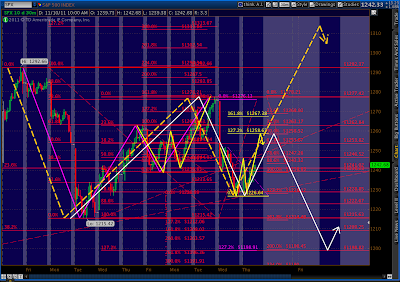 The DX, EUR/USD, and SPXU all are sporting good harmonics using Tuesday's high and Wednesday's low. 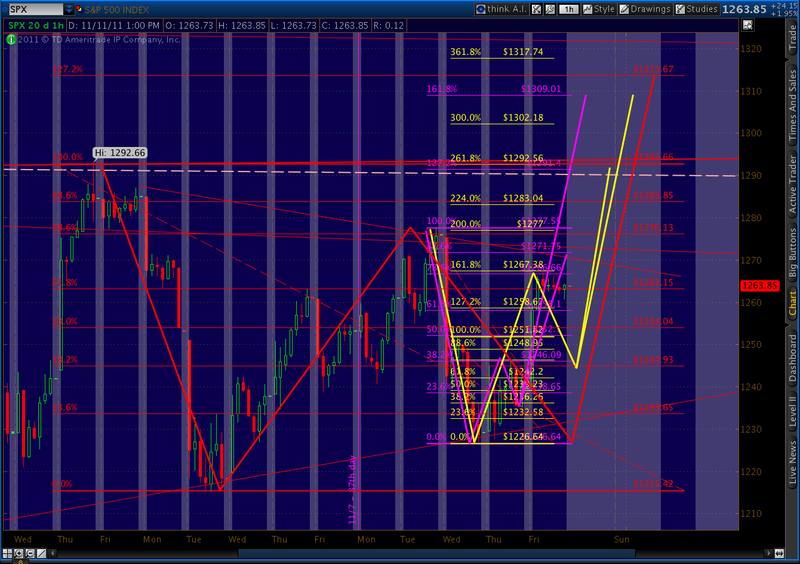 It sure could, although it could just as easily be a Bat that reverses at 1271 (the .886) as mentioned above. That's what's a little frustrating right now. 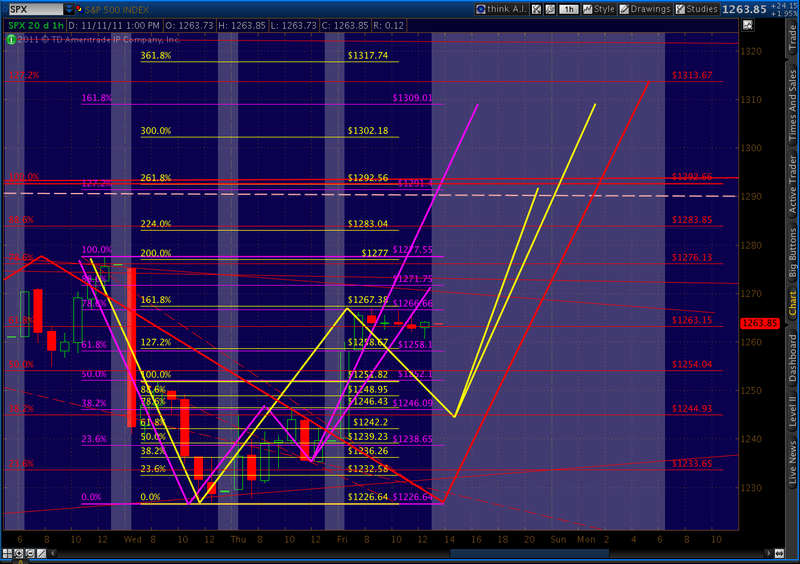 A Bat reverses right about now, but the butterfly (and several other indicators) could take us to 1307-1313. Be careful, folks. Pebble thank for the update. My screen is fulled up with so many retracements I am begining to lose track of them all.